Here’s Mojo’s atrophotography post from the same evening. After some months away from dark skies, everything looks foreign, even to long time observers like me. I recognize the familiar constellations, but sometimes I forget where some of my favorite telescopic targets are located. On nights like this, I don’t just revisit the same old objects with my telescope. I sit down and scan the sky — from horizon to horizon — with my binoculars, until a stargazing project presents itself to me. There are a lot of binoculars out there. When I was beginning my amateur astronomy hobby 25 years ago, I bought a pair of Carton Adlerblick 7 X 50 (7 times magnified) binoculars. I still use them, though I do have more powerful binos, which weigh more, which is why I rarely use them. These Adlerblicks are my go-to binoculars. They are lightweight and are great for both terrestrial and celestial viewing. So, on some dark sky nights, I start my observing session by scanning the sky with my binoculars, and hope to find an object or theme of objects to observe. I end up with an old favorite in the binocular view pretty quickly almost every time. That happened last night (March 9, 2013), as I scanned the northern constellations from Amboy Crater, our current favorite dark sky site. All of a sudden, my entire binocular field of view was bisected by a line of bright stars, Kemble’s Cascade, an old favorite of mine! This is one of the joys of visual observing. I love to scan the sky with binoculars, then dig a little deeper to see what is in the neighborhood using my star charts. After years of observing “lists” of projects, I really enjoy just letting my binoculars be my guide to a night of stargazing. Kemble’s Cascade is a nearly straight line of stars as long as 5 full moons lined up side by side. It completely spanned my binocular field of view. Kemble’s Cascade is one of the finest binocular objects in the winter sky, but is located in one of the most difficult constellations to actually see: Camelopardalis, the camel leopard (or the Giraffe). It’s located near Polaris, between and above Cassiopeia and Perseus. Quick hint: I aim my binoculars at the Perseus Double cluster, and scan up from there until I find it. This asterism (not a constellation, but a group of stars forming some shape) was named after Father Lucian J. Kemble, an amateur astronomer from Canada who first saw this cascade of faint stars. I took out my sketch notebook and sketched this view from my binoculars. 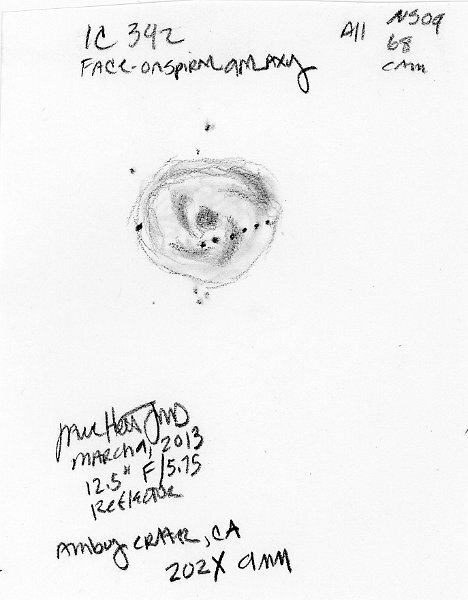 Now my evening stargazing project had a start. 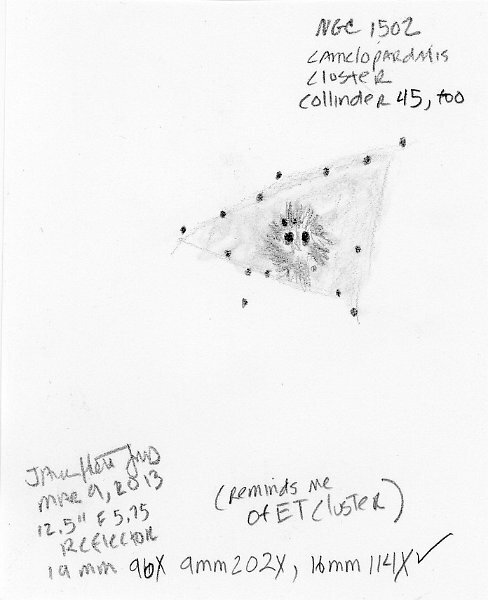 After I made this sketch, I opened my Night Sky Observer’s Guide (NSOG) to the constellation Camelopardalis to remind myself what else was in the neighborhood. This two (three, actually – the third being southern skies) book series is organized by constellation with one book for summer and spring constellations, and another volume for autumn and winter. It’s my go-to observing book. I can open it to any constellation and find a wonderful starhopping project for the night. Camelopardalis is a northern circumpolar constellation. Find Polaris, the North Star and you are in the celestial neighborhood of the camel-leopard, or Giraffe constellation. 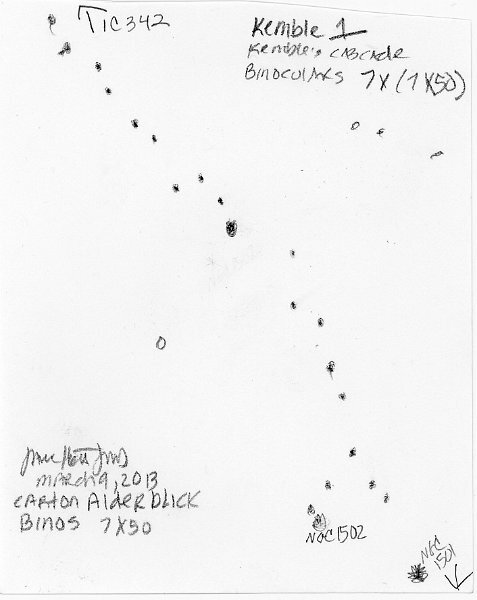 One of the finder charts in the chapter on Camelopardalis showed several objects near the Kemble’s Cascade line of stars – a star cluster, a planetary nebula and a galaxy. I hadn’t looked at these for a while – two are on William Herschel’s small project list, the Herschel 400, which I observed many years ago. So I settled in for a pleasant hour of starhopping. Through the telescope, only a few of the stars of Kemble’s Cascade filled each eyepiece view. So first I just rode along the cascade, star by star. The first of the deep sky objects soon was in my eyepiece. NGC 1502 – The New General Catalogue of Nebulae and Clusters of Stars (NGC) is a well-known catalogue of deep sky objects compiled by Dreyer in 1888, as a new version of John Herschel’s Catalogue of Nebulae and Clusters of Stars. NGC 1502 is a stunning open cluster near the south end of Kemble’s Cascade, 2,680 light-years away, and estimated to be only 11.2 million years old. 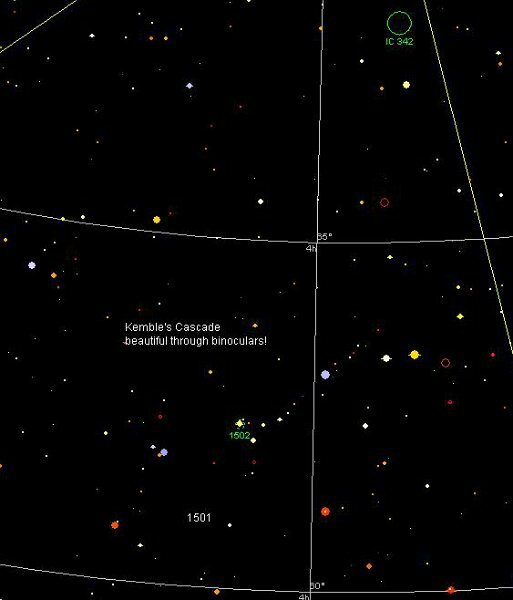 Once you memorize where to find the Cascade (I can see this cluster naked eye from our dark sky observing spots, and use it to find Kemble’s Cascade), you have a second easy-to-find, and crowd pleasing object to share with others. The cluster is rich with bright stars, shines at magnitude 5.7, making it naked-eye visible from a dark sky. It will remind experienced stargazers of the ET Cluster, NGC 457 in nearby Cassiopeia. (At least it reminds me of that nearby cluster)! They both have two prominent non-human “eyes” comprised of brighter stars. Take some time looking at this cluster, and find the pretty blue and gold double star embedded in it. NGC 1501 is a bright planetary nebula with a blue color visible from a dark sky, glowing at magnitude 11.5, located 4,900 light-years distant. Though it’s not naked eye visible, it’s easy to find in a moderate-sized (6-12 inch) telescope. 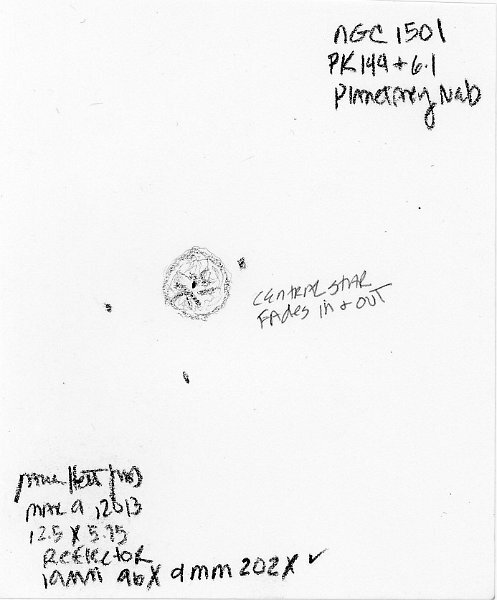 It will remind experienced observers of the Eskimo nebula in Gemini. If your sky conditions allow, view this nebula at high power – I used a 9mm eyepiece on my 12.5 inch f/5.75 reflector for a magnification of 202X. At this power I was able to see the faint blue color, dark and light markings, and see that it was wider in the middle. 8-10 inch telescopes will show this detail at high power from a dark sky. IC 342 (IC stands for Index Catalogue, one of two supplements to the NGC. The first was published in 1895 and contained 1,520 objects, while the second was published in 1908 and contained 3,866 objects, for a total of 5,386 IC objects). IC 342 is a spiral galaxy seen face-on. The nucleus is bright and the spiral arms are visible in a dark sky through moderate sized telescopes such as my 12.5 inch reflector. The magnitude is an easy 9.1 — easy through a telescope, not naked-eye visible. It is 6.5 million light years away. On the SW side of the galaxy, a string of foreground Milky Way stars – 6 stars in a straight line – are easy to see. IC 342 is one of the brightest two galaxies in the IC 342/Maffei Group of galaxies, one of the galaxy groups that is closest to our Local Group. In 1935, Harlow Shapley declared that this galaxy was the third largest spiral galaxy by angular size then known, smaller only than the Andromeda Galaxy (M31) and the Triangulum Galaxy (M33), being wider that the full moon. (Modern estimates are more conservative, giving the apparent size as one-half to two-thirds the diameter of the full moon). It is almost hidden from view behind the veil of stars, gas and dust clouds in the plane of our Milky Way galaxy! Don’t be afraid to scan the sky with binoculars, even if you don’t know where you are looking or what to do you once you see something interesting. 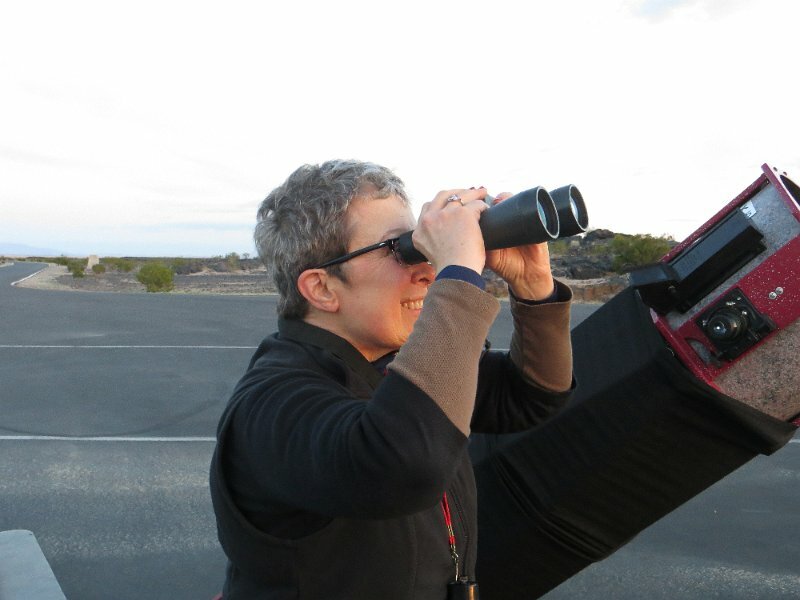 Ask a nearby astronomer, and in many cases, she will be able to aim her telescope at your new binocular discovery. It’s a great way to start your stargazing hobby! Five full Moon diameters should be about 2.5 degrees. While i use 8×21 often, the math says i should see perhaps mag 8.5, not the dimmer 10th magnitude stars in Kemble’s Cascade. Kemble’s Cascade is 2.5 degrees. You can see all the bright stars easily with 7×50′s, and from a dark sky you can see the asterism naked eye, at least I can.